This story edited from the original © 2012 The Associated Press. Tesla Motors has unveiled a solar-powered charging station that it said will make refueling electric vehicles on long trips about as fast as stopping for petrol and a bathroom break in a conventional car. Tesla CEO Elon Musk said at a news conference that the company’s roadside Supercharger has been installed at six highway rest stops in California. The free stations are designed to fully charge Tesla’s new Model S sedan in about an hour (giving it a 300 mile range). A half-hour-long charge can produce enough energy for a 150-mile trip, he said. The first six Superchargers, developed and deployed in secret, are in Barstow, Hawthorne, Lebec, Coalinga, Gilroy and Folsom. Tesla spokeswoman Christina Ra said they are open only to company employees, but would be available to the public in early October (2012). Musk said his Palo Alto-based company planned to have more stations running throughout California and in parts of Nevada and Oregon by the end of the year, and expected to blanket “almost the entire United States” within two years. 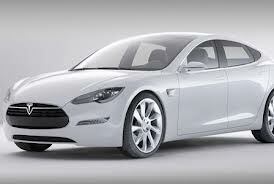 Tesla unveiled the Model S, its first mass-market vehicle, in June. The base model costs sells for $49,900 after a federal tax credit. Along with persuading consumers that electric vehicles are practical, the charging stations were developed with an eye toward alleviating doubts about their environmental effects. Musk said the solar-powered stations in California would produce more clean energy than is needed to keep cars running. This is the the New York Times’s take on the story.